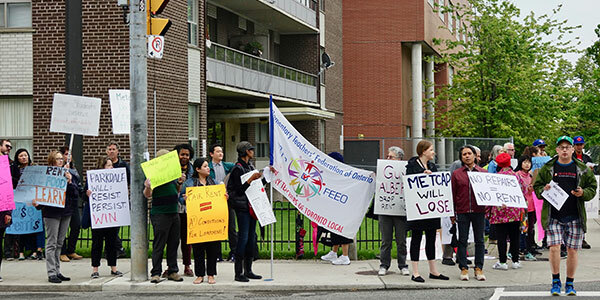 ETT stands in solidarity with the hundreds of Parkdale tenants protesting the unsafe and unhealthy conditions in the apartment buildings operated by MetCap Living Management in which they reside. Tenants in a dozen buildings have been withholding their rent since May 1, 2017 in an effort to compel MetCap to make desperately needed repairs and to protest the landlord’s unfair rent increases, which residents say are being used to drive out vulnerable, low-income tenants. 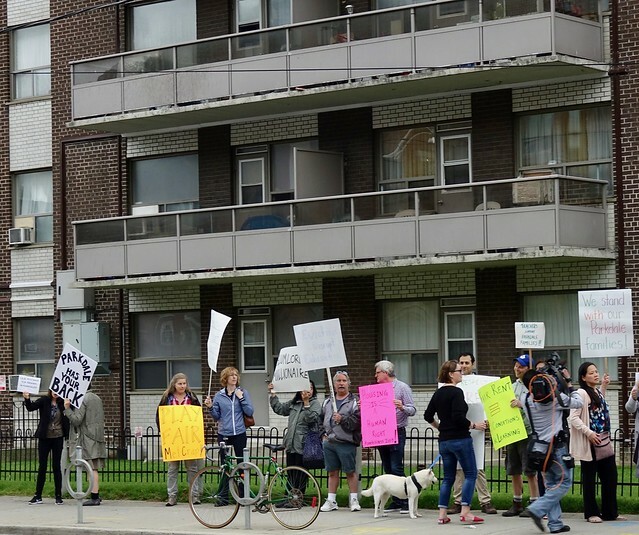 This week, ETT members joined with the tenants, other labour and social justice groups, and community allies in their stand for justice. Photos from the Monday protest are available below via Flickr and on Facebook. ETT will be joining protestors again on Wednesday, June 7, 2017. All members are encouraged to lend their support to this important cause. Photos courtesy of Sebastian Hergott/ETT member.